YouTube Comment Formatting – You want to format your comment text in YouTube? Do you know you can even add Bold, italic, strike through comments on YouTube Videos? If you are looking for a simple guide to do this, you are in the right place. 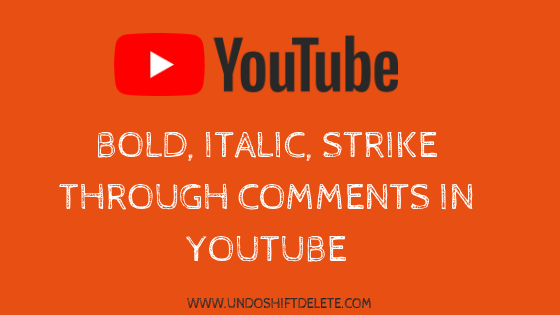 Keep reading for the step by step guide on How to Format YouTube comments to add Bold, Italic or Strike-through texts. YouTube is the largest video sharing platform founded by former employees of Paypal in 2005. Soon after that Google bought YouTube for stunning amount in 2006. Since then YouTube is a subsidiary product to Google. YouTube has added many more features after Google acquired it especially. It has grown and reached to the billions of users. I didn’t even know that YouTube has a feature to Format the comment text with Bold, italic and strike-though etc. I have seen this on one of my YouTube channel video and tried myself with different possible options. Most of the websites allows CTRL+B for Bold text, CTRL+I for Italic text, CTRL+U for Underlining. I just gave a try with this method and eventually it didn’t work. Then I tried using HTML tags for YouTube comment formatting. Like <b> tag for Bold text, <i> for Italic text, <u> for underlining. Same is the result this time as well. It simply didn’t work out. For commenting with a bold text on YouTube videos, place asterisk symbol (*) before and after the word. Suppose if you want to comment YouTube on Bold text – Hey Hello, This is my YouTube Channel. Add comment like – Hey Hello, This is my *YouTube* Channel. Refer to the image below. And the result would be – Hey Hello, This is my YouTube Channel. with YouTube in bold text. For Italic comments, you have to use Underscore symbols ( _ ) before and after the word which you want to make italic. Now I want to comment on YouTube video with italic format text. Here I how we can do it. So it will be appear like – Welcome to UndoShiftDelete Channel. Here is the screenshot of it. For getting strikethrough for a word, you have to use hyphen symbols ( – ) around that particular YouTube comment text. Just add hyphen symbols before and after that word to make it strike through. Now I would like to comment – This is my first blog UndoShiftDelete. To strike through the blog word, do this – This is my first -blog- UndoShiftDelete. Result of this would be – This is my first blog UndoShiftDelete. You can combine all these formatting and add comment to YouTube. To do this, add whatever the formatting you need to a single text and then comment. Other formatting options includes – press ENTER button to start a new paragraph. For paragraph break, you can use SHIFT+ENTER button. Suppose if you want display the text like *UndoShiftDelete* without getting it Bold, you can use double asterisks to display as is. Use **UndoShiftDelete** to comment as *UndoShiftDelete*. YouTube has released YouTube Comment Formatting with Bold, Italic and Strike through text. It’s not that straight-forward to use this text formatting in YouTube comments. Many of us tried with Keyboard shortcuts and HTML tags but they will not work. You need to use asterisks symbols for Bold, hyphens for strike through, underscore symbols for italic words. Use these tricks to comment with text formatting in YouTube. I’m wrapping up this article on YouTube Comment Formatting with this. Cheers!